Former UFC heavyweight champion Andrei Arlovski faces off with Team Bison heavyweight slugger Brett Rogers. The winner of this fight will more than likely get a chance to lock horns with Strikeforce heavyweight champion Alistair Overeem. Don’t expect much ground work out of these two, as they will both be looking to put the other man to sleep. Arlovski has the advantage on the feet when it comes to pure striking technique and is the faster of the two. For Rogers, he will have the strength and power advantage over the smaller Arlovski. Although unlikely, if the fight were to go to the ground, Arlovski would have the edge with his submission grappling background based in Sambo. Arlovski has all the tangibles to win the fight and he should win the fight, but his chin will be the question mark. He was winning the fight with Fedor Emelianenko up until his chin failed him and what is there to say that it won’t happen again. Rogers has tons of power in his punches and could very well put Arlovski out. Arlovski needs to stay on the outside and use his speed to get in and out, not staying on the inside where Rogers will have his best chance to end the fight. 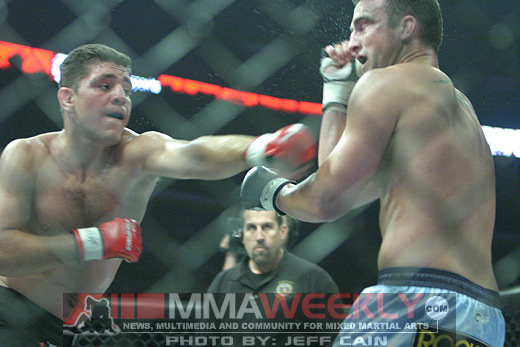 Brash Cesar Gracie trained fighter Nick Diaz faces off with heavy-handed slugger Scott Smith. Both are coming off impressive stoppages in their last fights on the same night. 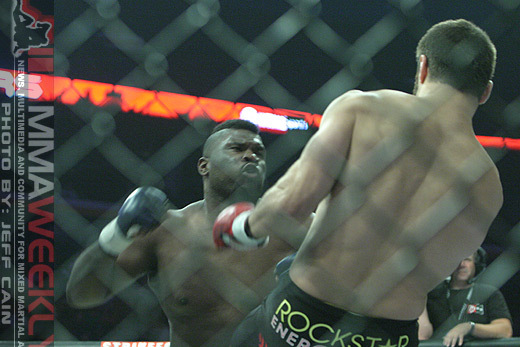 Diaz finished Frank Shamrock, while Smith knocked out Benji Radach. Smith will be a good test for Diaz at middleweight, while Smith will face a quality ground fighter for the first time in ages. Diaz will have the advantage on the feet when it comes to speed and technique, which helps to make up for the lack of power in his strikes. Smith has tremendous power in his hands. He proved it when he came back to stop Benji Radach. So he’ll look to get in range to land one of his big shots. Obviously, if the fight goes to the ground then Diaz will have the advantage with his excellent jiu-jitsu pedigree. Diaz has stated his intention to stay at middleweight and this fight should be a good way to test his potential in the weight class. Smith on the other hand is looking to work his way up to a title shot sometime in the near future and another impressive knockout will do a lot to help him. He will need to turn the fight into a brawl and avoid getting taken down. Diaz will look to turn the fight into a technical one as that favors him, whether it be on the feet or the ground. In a battle of welterweight sluggers, Las Vegas based striker Phil Baroni takes on the hard-hitting Joe Riggs. These two have had a harsh exchange of words in the weeks leading up to the fight indicating that neither will be holding back in this fight. These two will more than likely never see any action on the ground until one of them is dazed and confused. Baroni will pack more power in his punches and will have a nice size advantage over Riggs. On the other hand, Riggs will be the much quicker fighter and will have the advantage on the ground if the fight ever gets there. This fight is one of those guilty pleasures, as it expected that each is going to try and knock the other fighter’s head off. Baroni has gone 3-0 since moving down to welterweight and seems to be where he belongs after being outsized at middleweight. Baroni will want to get on the inside and turn the fight into a brawl. That is where he does his best work. Riggs needs to stay on the outside and pick his shots. If that doesn’t work then putting Baroni on his back and pounding him from the top is his other option. Former UFC heavyweight champion Kevin Randleman faces off with Ultimate Fighter 2 participant Mike Whitehead. Both fighters will be looking to win impressively, as Strikeforce has a rather thin light heavyweight division, and the winner could very well be considered for a title shot sooner rather than later. Both are well versed in wrestling, but Randleman is a step above Whitehead in that department. That could very well be the difference in the fight. Randleman has shown that he has power in his hands, but his technique isn’t all there. Whitehead should be able to take advantage of that and keep the fight on the feet, where he can score points. For Randleman, he’ll need to stick to his wrestling and use it to neutralize Whitehead for the entire fight. Brazilian wunderkind Rafael “Feijao” Cavalcante faces off with UFC veteran Mike Kyle. Kyle is a late replacement for Jared Hamman, who pulled out of the fight because of an injury sustained during training. Feijao was originally scheduled for a title shot against Renato “Babalu” Sobral, but plans changed and he takes a risky fight that could cost him a title shot if he doesn’t win. Kyle has nothing to lose and that is a dangerous thing for Feijao, who has a lot to lose because he is next in line for a title shot. Feijao is the better striker and ground fighter, but Kyle will be much bigger coming into the fight. Kyle will look to land one big shot and propel himself into being a legit fighter in the light heavyweight division. Feijao should play it safe and take the fight to the ground, where Kyle will be a fish out of water.